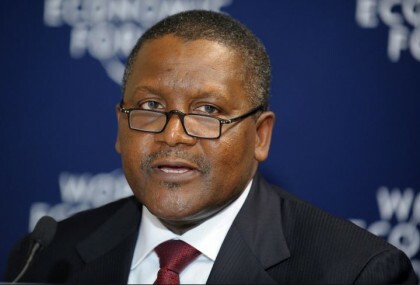 Nigerian billionaire Aliko Dangote, Africa’s richest person, fell 25 places on the Bloomberg Billionaires Index on Monday as the naira tumbled on its first day of trading without a peg to the U.S. dollar. Dangote’s fortune fell $3.7 billion, knocking him to No. 71 on the Bloomberg ranking, down from No. 46 on Friday. The majority of Dangote’s $12.7 billion fortune is derived from a 91 percent stake in Dangote Cement Plc, which shed 2 percent in trading Monday. The Central Bank of Nigeria began auctioning dollars to limit the currency’s decline. The bank had been using capital controls to stem an outflow of dollars after the naira crashed in February 2015 when oil prices slumped. Dangote’s slide came as equity markets worldwide surged on hopes that British voters would choose to remain in the European Union. The upswing lifted the collective net worth of the 400 billionaires on the index by $44 billion to $3.99 trillion. Amancio Ortega, Europe’s richest person, French luxury billionaire Bernard Arnault and Amazon.com founder Jeff Bezos led with respective daily gains of $2 billion, $1.4 billion and $1.1 billion. After Dangote, the second-biggest drop belonged to U.S. casino billionaire Sheldon Adelson, whose Las Vegas Sands fell 5.6 percent along with other gambling stocks after reports that revenue was trending downward. Adelson, who lost $1.1 billion Monday, is the world’s 29th-richest person with $23.3 billion.